A dipping chip that will not break on you, tastes great, less salt, less fat, and you can make them yourself. 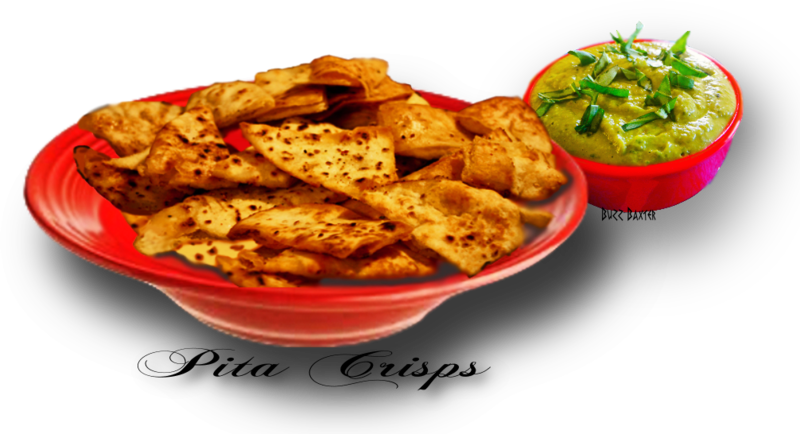 You are never going to use anything other than these when you have a dip you are serving to your guests. You have total control over your taste and ingredients. You can make them plain or spicy hot, sweet, and use spices that are completely compatible with your main course. These pair well with wine or beer or lemonade. They will store well for a good week and probably won't last that long. They are a great snack just by themselves without a dip. have 16-20 triangles that are about 2 inches wide on the big end and a sharp point at the other. and salt to your taste. poppy seeds, pepitos or grated cheese or whatever your imagination suggests to you. the pocket will work,  but they will be un-necessarily thick and somewhat tough to bite through. Easy Pita Chips ✯ Watch more Videos at Vodpod.